It seems like every natural disaster, geologic activity, or extreme weather event is the basis for someone to forecast the end of the world. Last week's Bitter Springs landslide along highway US 89 in northern Arizona is being touted as evidence for a global collapse of the earth's crust. Never mind that this looks to be a shallow seated landslide recurring in an ancient (Quaternary-aged) slide complex. In my humble professional opinion, this landslide is not presaging any global catastrophe, although it is effectively a catastrophe for everyone trying to travel across the region. ADOT posted a new aerial view of the Bitter Springs landslide shot from helicopter that appears to show the edges of the slide extending downslope from the section of US 89 destroyed by the movement. They say to "Check in tomorrow for a video update from engineers on site." The webpage features current and past news releases on ADOT’s efforts to assess the damage, reroute traffic and determine the long-term plans for the highway. Videos, photos and blog posts featured on the page demonstrate the significant damage to the roadway, and a detailed detour map guides motorists along the roads that are open for travel in the area of the Feb. 20 landslide near Echo Cliffs. Since its debut last week, ADOT’s two-minute-long video (www.youtube.com/ArizonaDOT) on the damaged pavement has received more than 30,000 views. Photos on the ADOT Facebook page have been shared more than 7,000 times. ADOT’s next video will highlight the geotechnical engineers’ efforts to assess the stability of the mountain slope. Users of the webpage can also sign up for updates on the US 89 closure. The public can also contact the Project Hotline toll-free at 1.855.712.8530 or via email at projects@azdot.gov. 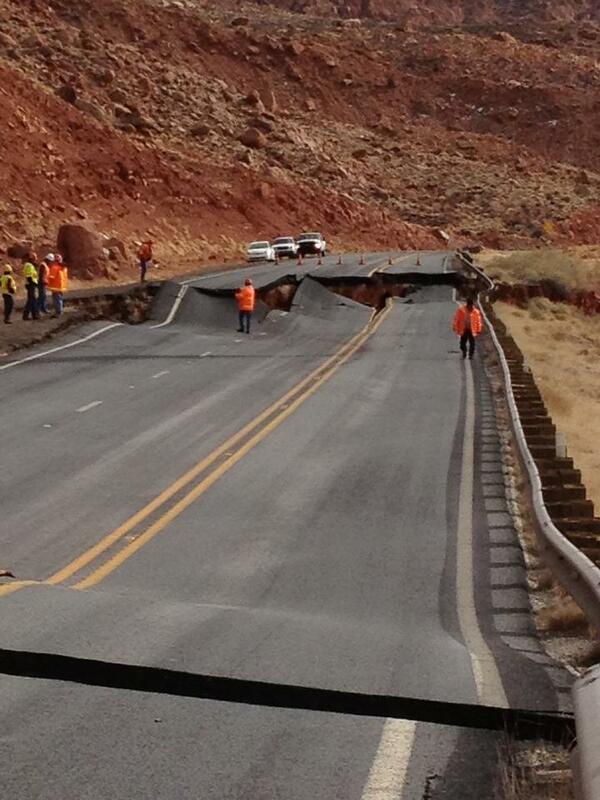 US 89 will remain closed for the immediate future. There is no timetable to reopen the highway, which has approximately 500 feet of damage, including 150 feet of pavement that settled four-to-six feet due to a landslide and failure of the slope. PHOENIX — In light of last week’s landslide that forced the closure of US 89 south of Page, the Arizona Department of Transportation has launched a range of communication tools, including a new webpage (www.azdot.gov/us89) dedicated to keeping the public informed about the status of the closure and alternate travel routes, complemented by captivating video and photos of the roadway damage on US 89. Last night my wife and I were finishing dinner around 7:45 when we heard a prominent "boom." We thought something hit the house - the javelina nose up around the doors occasionally and knock things over. Perhaps a sudden gust of wind tipped over patio furniture? But a tour around outside found nothing. This morning, the newspaper says there were reports from all over the west side of Tucson (we live in the Tucson Mtns, about 4 miles west of downtown) of the boom and no obvious explanation for it. Speculation is that it was a sonic boom. Nyal Niemuth, Chief of the AZGS Economic Geology Section [at right in light colored shirt. Credit, BLM] recently briefed a delegation of cabinet-level government officials from Afghanistan on mining in Arizona. The delegation was in Phoenix for a 23-day, four city tour of the US mining industry and government agencies. Matt Shumaker, the Bureau of Land Management's (BLM's) Chief Mineral Examiner hosted the group at the BLM National Training Center in Phoenix, Arizona. According to the BLM Daily agency newsletter, the group also visited the Arizona State Mine Inspector Office and the USGS headquarters in Reston, Virginia; the Department of Interior headquarters in Washington, DC; the Colorado School of Mines in Denver; and mining sites around Tucson and Denver. BLM says the "USGS organized the Afghan officials' visit to the United States with assistance from the DOI International Technical Assistance Program, and the Department of Defense with funding from USAID." Ancient landslides are extensive in the Echo Cliffs where last week's landslide destroyed a section of US 89. The February 20 Bitter Springs landslide occurred within the boundaries of the Glen Canyon Dam 1:100k sheet. This was mapped by George Billingsley of the US Geological Survey in Flagstaff and has been peer reviewed, but is still pending USGS publication. In response to the need for quick geologic information, the USGS released draft copies of the map to AZGS and ADOT to help us better assess the geologic situation. The map at right is a small piece excerpted from the full map. The arrow points to the general area of the new landslide. "Ql" are Quaternary aged landslide deposits. Note the large block on the hillside to the right (upslope) of the highway. Note also the extensive landslide deposits that cover much of the western slope of the Echo Cliffs. This information is preliminary and is subject to revision. It is being provided by the USGS to meet the need for timely best science. The information is provided on the condition that neither the U.S. Geological Survey nor the U.S. Government may be held liable for any damages resulting from the authorized or unauthorized use of the information. Thanks to the USGS for making these materials available to us. 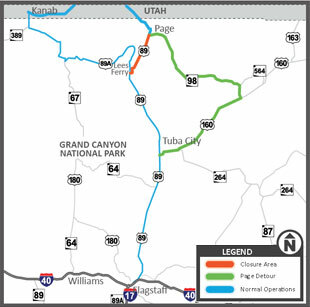 AZGS is posting an online interactive map showing alternate routes around the Bitter Springs landslide that closed highway US 89 in the Echo Cliffs south of Page. ADOT warns that it may be months before the road might be reopened. The map was built by AZGS Geoscience Information Manager Janel Day. According to Passport's news release the combined measured and indicated mineral resources total 397.94 million tonnes of mineralized material with an average KCI grade of 14.65%. The mineral resource estimate of the combined properties includes measured and indicated mineral resources totaling 397.94 million tonnes of mineralized material with an average grade of 14.65% (equivalent to 58.35 million tonnes of KCl). For the indicated category of the combined properties, 363.17 million tonnes of mineralized material with an average KCl grade of 14.68% (equivalent to an indicated mineral resource of 53.35 million tonnes of KCl) have been estimated. For the measured category of the combined properties, 34.77 million tonnes of mineralized material with an average KCl grade of 14.38% (equivalent to a measured mineral resource of 5.00 million tonnes of KCl) have been estimated. Potash mineralization consists of sylvinite and carnallite. The inferred mineral resource of the combined properties consists of 790.73 million tonnes with an average KCl grade of 12.99% (equivalent to an inferred mineral resource of 102.74 million tonnes of KCl). Passport Potash President and CEO, Joshua Bleak said,"Our project has never been in as strong a position as it is today, and we are confident that the PEA that will be released within the next two weeks will make it even stronger." The report recommends additional exploration drilling locations to evaluate additional potential resources. "After receiving environmental clearance on Monday, ADOT will soon begin drilling the shafts to deploy equipment that will measure slope movement at a specific location. Until it has been determined that the area is stable, ADOT cannot move forward with a design project to repair the highway." http://www.lakepowelllife.com/index.php?option=com_content&view=article&id=4029:urgent-it-was-a-landslide-that-caused-highway-89-buckle-closure&catid=186:latest-local-news&Itemid=18 "ADOT Public Information Officer Tim Tate says the initial theory by state geo-technicians that the implosion of asphalt was caused by a sinkhole has evolved into the understanding that the road ruptured during a landslide that caused a 150-feet gash across the highway and created a 5-feet deep tear." GSA publishes Hildebrand's "Mesozoic Assembly of the North American Cordillera"
Tucson-based geologist Robert Hildebrand's new Geological Society of America's Special Paper, "Mesozoic Assembly of the North American Cordillera," is now available from the GSA bookstore. Expect it to offer a controversial reinterpretation of Cordilleran tectonics. Bob's previous GSA Special Paper 457, "Did Westward Subduction Cause Cretaceous–Tertiary Orogeny in the North American Cordillera?," was described as an "iconoclastic model for the Cretaceous–Tertiary development of the Cordilleran orogen." It's become GSA's best-selling Special Paper ever. GSA describes the new volume, "In this well-illustrated book, Hildebrand builds upon his model for the Mesozoic collision of the exotic Rubian ribbon continent with the western margin of North America presented in GSA Special Paper 457. Starting with an overview of Cordilleran exotic and suspect terranes, he goes on to integrate the disparate fragments into a dynamic model involving arc magmatism, arc-continent collision, slab failure magmatism, and meridional migration. While the main focus is on the offshore assembly of the Rubian ribbon continent, Hildebrand explores its interactions with North America during the Sevier and Laramide events and concludes that North America was the lower plate in both. 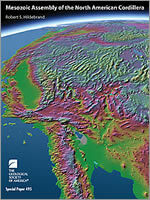 The volume will be of great interest to the general geological community, including advanced students, as it presents new ideas on the Mesozoic assembly of California and provides the first overview of the North American Cordillera since GSA’s Decade of North American Geology volumes 20+ years ago." The new paper is 169 pages with 65 color figures including a big fold-out map of North American Cordilleran terranes in a back pocket. Scientific American today reported on the AZGS-managed project to build the National Geothermal Data System with funding from the US Dept. of Energy's Geothermal Technologies Office. We have over 3,500 data sets with over 5.2 million data points online now with new data being added by 50+ data providers nationwide. It's fascinating to see how online news is circulated. The Geological Society of America’s "Geosociety" site retweeted today’s Scientific American tweet to their ~ 7,800 followers. Geology.com plans to broadcast it tomorrow and their tweets are usually retweeted by Earth News to their ~44,000 followers. And these are dwarfed by the ~512,000 who follow Scientific American. Conor Watkins and J. David Rogers of Missouri S&T University have an incredibly rich website on the topic of Megalandslides of The Colorado Plateau. The site includes presentations they have given over the past decade mapping the extensive landslides across the region, with clear diagrams describing Toreva blocks, and the complex histories of some these huge features. 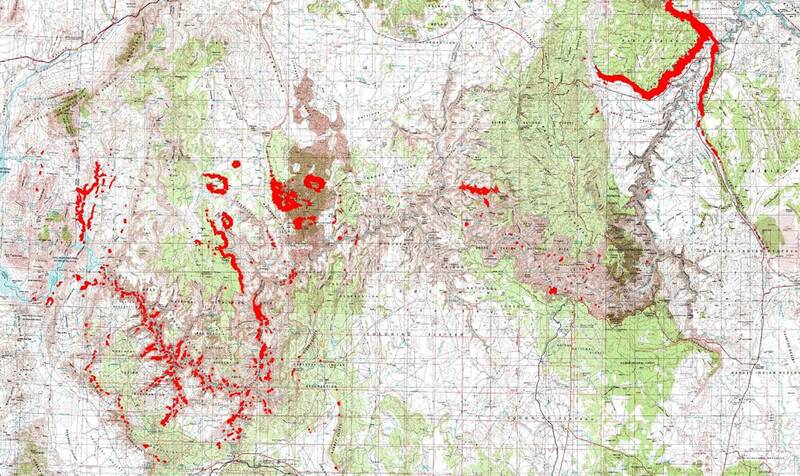 The map above shows landslides mapped by them and others, shown in red. The Echo Cliffs section where the Bitter Springs landslide occurred on US89 is at the right of the map, with individual disconnected slides along the NNW-SSE trending line. The ancient slide that contains last week's slide is the largest in this string. Arizona Geology hits 1,000,000 page views!